One of Hume's great insights is that we do not see causation per se. If we roll two billiards balls toward each other, they collide and continue on in different direction. The inferences we draw about the nature of their interaction is not based on observing causation, but "...are founded merely on our experience of their constant and regular conjunction." In other words the collision of two balls has a predictable sequence. Hume is not, of course, the last word on this observation - probably Kant had the last word (to date), but Hume's is a very important observation. We do not see causation, we see a sequence of events, and it is the regularity of our observations which gives rise to the idea of causality. This might these days be seen as a quaint definition, but in fact it still carries a lot of authority. We might quibble with the notion that the sun rises everyday - by saying that actually the earth turns; or that the sun will die in 5 million years; or by saying that it does not rise in the high Arctic during winter - but in everyday life the sun is observed to return each day by everyone on the earth, and the exceptions are do not deny the regularity of the observations of billions over thousands of years. The sun always rises. 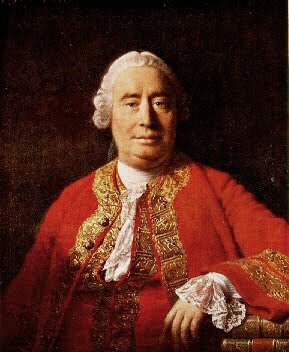 A miracle, according to Hume, is "a transgression of a law of nature by a particular volition of the Deity, or by the interposition of some invisible agent". The example he uses is the raising of a man from the dead. It would be extraordinary for a healthy person to drop down dead. But it would not be a miracle because we know that such things have been observed in the past, and that it breaks no law of mature. But the opposite, the raising of a person from the dead into life, does break the laws of nature. Hume probably chose this example to directly irritate Christians whose religion centres on the belief that Jesus died and was resurrected, and that they themselves will have everlasting life after death. But note that Hume is not denying that miracles can happen. What he is doing is trying to establish the basis on which a reported miracle might be credible. And in Hume's mind a miracle would only be credible if other explanations were less believable, less consistent with experience, than the miracle itself. In the case of a dead Jesus being reanimated the report is scarcely credible at all, and is most likely false. At least there is no evidence presented which outweighs the breaking of the laws of nature. In which case Christians have most likely been deceived in the first place, and are deceiving us when they insist it happened. I would say that after 263 years the argument has stood up well to the test of time. For a slightly chaotic, but none the less fascinating introduction to Hume try listening to the BBC's In Our Time podcast. A more thorough online introduction can be found in the excellent Stanford Encyclopedia of Philosophy.